The PTH test measures the PTH blood level. What is a PTH test? A PTH test measures the PTH blood level and calcium level. Why is a PTH test important? The PTH test helps evaluate the function of the parathyroid gland. This PTH Test is a blood test. The PTH test, also known as a PTH blood test, intact PTH lab test and parathyroid test, measures the intact PTH blood level and calcium level. PTH, or parathyroid hormone, made by the parathyroid gland. The parathyroid glands sit on the edges of the thyroid gland but, in spite of their name, are not involved with producing any thyroid hormones. PTH plays an important role in calcium regulation in the body. PTH is secreted when calcium levels are low to help increase blood calcium levels. PTH secretion is shut off when calcium levels are high. Abnormal PTH levels often result in abnormal calcium levels which can potentially result in life-threatening conditions. The term hyperparathyroidism is used when the PTH test level is found to be abnormally high. The term hypoparathyroidism is used when the PTH is found to be abnormally low. Because of its intimate relationship with calcium, the calcium test is included with this PTH test. In addition to screening PTH levels when calcium levels are abnormal, there are other situations in which a person needs to have a PTH test. People who have had parathyroid surgery or are on dialysis for end-stage kidney disease need to have their PTH test levels measured on a consistent basis. To get a PTH blood test near you, just order online. After getting your blood drawn at the selected Quest lab, your PTH lab results will be available for electronic download. 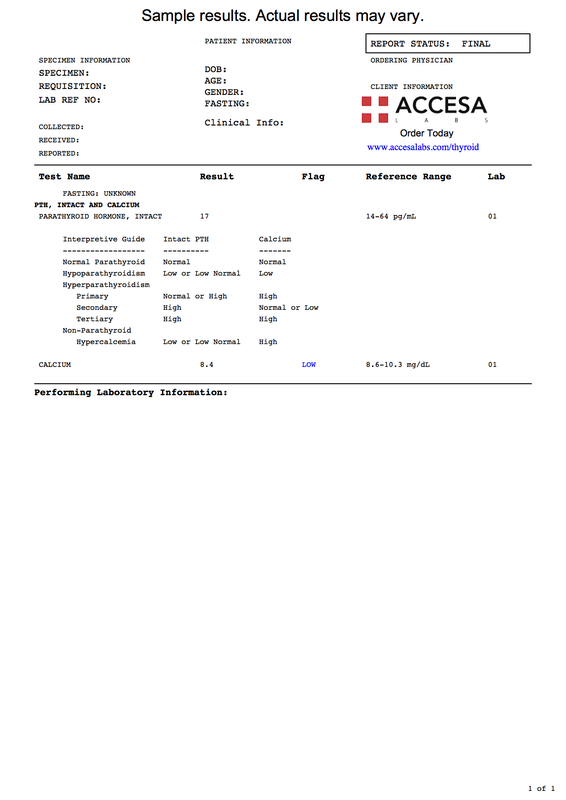 As can be seen on the sample PTH lab report above, your PTH test report will show your PTH intact and calcium blood levels as numerical results. Based on how your blood levels compare against the lab's reference ranges, an interpretation can be made as to whether the parathyroid gland is functioning normally or you have hyperparathyroidism or hypoparathyroidism. PTH Test at Guaranteed Prices.